Before starting a new marketing campaign, you may be wondering if a toll free number will be useful. If you are considering getting a toll free number for your business as part of a marketing strategy, there are a few things to keep in mind before committing to a number. Toll free numbers are a very affordable way to boost any marketing campaign and they come with many benefits. Here are a few things to consider before deciding on your number. Toll free 800 numbers are a useful business tool used by many businesses; in fact, the popularity of these numbers has created a need for 800 numbers to expand to numbers such as 855, 866, 877, and so on. However, you shouldn’t just purchase any available number. The number you choose needs to be easy to remember in order for it to be the most useful number for your business. Vanity numbers are popular for this reason as well. When choosing a vanity number, make sure that it pertains to your business. You can use a company tagline or a short word that states what your store sells. Choosing all numbers or all letters is better than selecting a mix. Toll free numbers that combine words and numbers confuse customers and aren’t easy to remember. For example, 1-800-329-HOPS is not a good idea for a marketing number. You’re essentially asking your customers to remember a random group of numbers before a word. The only numbers before the word or phrase should be the 1-800. As with any marketing strategy, you’ll want to set goals that align with your overall vision for your company. Popular goals found in many marketing strategies include growing phone sales, generating leads, creating customer loyalty, and setting your business apart from the competition. Once you have your goals in front of you, then you can take time to develop the entire strategy effectively. Once you have chosen the right toll free number for your brand, then you can market it everywhere. Place your number on your website, brochures, social media accounts, billboards, business cards, radio and TV ads, magazine or newspaper ads, and on merchandise like pens and notebooks. Like any good marketing strategy, you need a way to track the influx of purchases from each outlet. That way, you can decide later on what works and what isn’t working for your company. Toll free numbers are the same. Some things are easy to measure, such as seeing a boost in phone calls for your toll free number. But in order to see just how many sales are taking place from this bump in calls and finding out where your new customers found the toll free number means you need to find a way to track the source of the phone calls. United World Telecom comes with a feature for all of their virtual phone numbers that allows you to monitor phone calls in your settings. The same day that you set up your toll free number, you can also set up your online account. You can manage all of your features from this account 24/7. A custom toll free phone number is an excellent choice for most companies as it is an inexpensive way to double your marketing efforts across all of your current campaigns. As long as you choose the right number to represent your brand, you should be on your way to success. This number not only communicates the benefits that your company provides, but it also reinforces your brand across several channels and helps to differentiate your company from its competition. If you are thinking about getting a toll free number for your business, consider contacting United World Telecom at 1-877-898-8646 to get started on choosing the best toll free number for your company. Expanding your business to a new area, such as Australia, is an exciting venture but it can also be a little overwhelming. On the one hand, you can reach a greater target market, on the other you suddenly have a long list of things to do and pay for. If you’re truly passionate about expanding your business venture to Australia, there is a way you can do so and at the same time keep your expenses to a minimum. How? By creating a virtual presence in Australia with virtual telephone numbers. It’s an efficient and affordable way to extend your company Down Under. Here are ten things you need to know to develop a virtual presence in Australia. Do your research: Every country has different laws when it comes to expanding your company, doing business, and paying taxes. Australia is no different. Just because you have a virtual presence in other countries, doesn’t mean it will work the same Down Under. That’s why it’s important to read up on the rules and regulations before you start. Choose your business structure: Even though you are establishing a virtual presence, you need to structure your business very carefully. Important things to consider include how much control you are going to have over this section of your company and how much you are going to delegate to someone else, and also what level of liability you will need. Decide what kind of virtual numbers you need: As well as virtual local numbers, you can also choose Australian toll free virtual numbers. These allow your customers to call you whenever they need to, completely free of charge. There are two main advantages to virtual toll free numbers. One is that they give your customers confidence in the size and reputation of your company. The other is that they garner customer appreciation. Apply for an Australian Business Number (ABN): Even with a virtual presence, you can’t start doing business Down Under without an ABN. An ABN is an 11-digit number which is unique to your company and allows the Australian government to identify you as a business owner. Once you have your ABN, you can register your business name, send invoices, and deal with taxes. Set up your Australian business website: Now you can really get to the meat of promoting your virtual presence in Australia. Once you have secured your business name, you can get a .com.au domain. You can use this to reach your target audience, and this is where your virtual phone numbers come into play. Post different ones on your website, social media, business cards, and email marketing campaigns. This way you can track your calls and see which marketing strategies are working the best. Register for the correct taxes: Australian taxes can be complicated and you need to know which ones to register for. This will depend on the goods and services you are providing. It might be a good idea to get some legal advice from a professional so that you don’t have problems down the road. Make the most of social media: You must be prepared to update your social media pages on a daily basis. This shows customers that your business is active. It also gives them other ways to communicate with you and to share information about your business with their friends. Develop an understanding of your client base: Your Australian clients are not the same as your American or Mexican clients. Each target audience has different needs and desires and may also have a different buyer’s journey. It’s important that you get to know them so you can offer them what they want. Start a business blog: This is a great idea, and you can even start it before you launch your business in Australia, to draw more interest and build anticipation. A blog or vlog is a great way to build transparency and increase your social media presence. It also provides a neat space for you to promote your products and services in a subtler way than pure marketing. A blog or vlog can be a great way to swing a doubtful customer into your favor. Be available 24/7: This is why you need virtual Australian phone numbers; so you will never miss a call. Calls can be routed to whichever number or numbers you choose. You can even set rules for certain times of day, so you will be able to deal with different time zones. Contact United World Telecom today and find out more about creating a virtual presence in Australia with virtual local and toll free numbers. When you call, don’t forget to ask for a free trial. There’s no commitment. Quality customer service is a necessity to run a profitable business that continuously attracts new customers and retains the loyalty of past buyers. Every entrepreneur values customer service, no matter the size of their business. Yet, new business owners and established professionals often hear the same advice about customer service management. Call center employees must be well-trained. Agents should also be friendly and patient to show customer appreciation while also making callers feel more comfortable when speaking with team members. What about repeat calls from customers? Finding a solution for customers during the first conversation is ideal. When a customer calls back to discuss the same problem, this is often negative and not the desired result after the first call. When you can fully satisfy the customer during the first call, this is known as achieving first contact resolution (FCR). FCR greatly elevates the customer service experience and prevents upsetting delays. Furthermore, it shows how knowledgeable your team is in your industry. Negative callback experiences lower staff morale and can frustrate callers. Resolve customer issues and they don’t have to call back to ask similar questions or inform you that your help was ineffective. Achieving the first-contact resolution at your call center is a unique process for every business. Use these four tips to help increase it. The first step to achieving first contact resolution is knowing your company performance by tracking metrics. Gather data to find areas where first-contact resolution is easily achieved and where more work needed. Tracking performance allows managers to see where employees need additional training and support, increasing the likelihood of solving customer problems on the first attempt. Areas of poor performance require special attention in the process of achieving first contact resolution. Understanding why FCR was not achieved by knowing why customers needed to call back is key for management to modify their training approaches and strengthen all aspects of the customer service approach. Knowing the customer is essential for achieving first contact resolution, and the best customer service agents understand customer behaviors on a deeper level. Understanding spoken and unspoken behaviors allows reps to better analyze individual needs and the most effective strategies during the call. Effective customer service agents often go off-script because they can notice the caller’s tone of voice and word choices. These observations help customer service agents address hesitation and confusion by providing more assistance during the first call. Understanding customer behavior while achieving first contact resolution does more than impress the caller. Customers will feel genuinely understood, and this strengthens their personal connection with your brand. A true sense of connection will naturally inspire buyers to continue investing in your business and recommending your services to others. Setting FCR as a priority means setting clearly defined goals. As these goals are being set, supervisors must explain why these guidelines are in place and the positive impact achieving first contact resolution would have on the company. If call center agents are only achieving first contact resolution, they might think this is a good sign without realizing FCR should be a frequent occurrence. FCR adds more value to the company, resulting in more calls and sales. Let employees know the importance of achieving first contact resolution at team meetings (or individually). Agents are communicating with customers every day, which provides an understanding of customers in a more personal way. Let your customer service agents tell you about their experiences with callers for a deeper level of insight. Then, show your team that you value their knowledge by incorporating their suggestions as you continue setting guidelines for achieving first contact resolution. After achieving first contact resolution is set as the priority that everyone in your business understands, data should also be gathered from the customer directly. Provide the option for customer surveys to allow customers to openly voice their opinion on your service. Management and agents can use customer input as a resource to determine the best course of action moving forward. Today running a successful business means finding a way to stand apart from competitors. Operating a business that customers enjoy connecting with leads to more purchases as callers speak directly with team members for assistance. Strengthening your first contact resolution is an important part of setting your brand apart as an expert in your market as well as a leader in customer service. Leaders in the customer service field are among the best assets for a business looking to grow. Your customer service agents are imperative to the efforts of becoming a more reputable business. Empowering your customer service teams will help them to be confident and impactful when speaking during phone calls. Keep in mind, you also have the option of using software and additional resources to help your customer representatives achieve first contact resolution goals. Are you thinking about getting a toll free number for your business? If you are running an eCommerce store or need to provide a customer service line, then you will want to consider getting one for your business. A toll free number is a national phone line that your customers can call for free from anywhere in the US. Virtual toll free phone numbers free up office space by connecting through the internet instead of a landline, which means you can connect your phone number to forward to any device of your choosing. Providing your customers with a phone line that they can call offers a way for your customers to reach out when they have an issue, and it creates another avenue in which they can make a purchase. If you’re still not sure how you can make your toll free phone number work for your business, check out these 7 quick pointers aimed at upping your business’s reach. Providing a toll free number for your business allows you to advertise with one number. No matter where your employees, stores, or customers are located, you can provide everyone with one number to dial. When your customers see this toll free number advertised somewhere they will automatically know it is for your brand, therefore, when you choose the toll free number that you want, make sure you choose one that has a nice flow to it or consider getting a vanity number. Toll free numbers are equipped with the ability to handle large calling volumes. Since they work in the Cloud, you won’t have to worry about a call dropping because toll free numbers offer call forwarding, meaning a phone call can be transferred instantly to the next available person. When a store is available at all times, a customer is more likely to trust that company with their business. Being able to answer your customers’ questions, take orders, and offer your customers a way to pay their bills over the phone at any time will create an instantly better relationship with your business and your customers. Customers won’t appreciate it if there isn’t a single phone number for them to contact if they have an issue. When your customers call your business, you can choose to greet them with an automatic message or send them straight to an available person. One way to tackle higher call volumes is to greet all of your customers with an initial welcome and continue onto a menu. Explain menu options so that your customer can choose with whom they want to speak to. For example, if they are looking to talk to someone in customer service, they can easily press a number to speak to customer service, but if they want to pay their bill, they can push the number that will direct them to the accounting office instead. If you have already invested in a toll free number and want to move locations, you can still move and keep your initial toll free number. If a move is better for your business, your toll free number won’t hold you back. You can still keep the number that you have been advertising with for years. Since toll free numbers work on a national level, you can promote your business outside of your town. Even if your shop is located in one neighborhood in one state, you can still advertise your products to customers located all over the US. When you have a toll free number, you offer your customers a free way to get into contact with your business. Which builds a certain level of trust. You can try out new ways of marketing by associating each campaign with a different toll free number and then measure which numbers are getting the most calls. This will quickly help you to figure out what means of campaigning are working and where you can change up your direction. One of the easiest ways to set your small business apart from the competition is to have stellar customer service, but many companies don’t bother. However, these customer service strategies will take your company from “just another business” to a company that your customers can’t part with. Although all businesses can benefit from having a strong customer service team, if you are the owner of a smaller company then you’re up against lower prices from big box stores, and usually, those stores carry more items than your small store can. How will your business compete? Big name stores like Wal-Mart and Home Depot have a lot on their sides, such as national advertising and bigger budgets, but there are still ways that small local businesses can compete with these big guys. Instead of making excuses as to why your business can’t compete, set a goal to not only keep your existing company, but bring in new consumers even as that big new competitor moves in on your territory. So what are the ways that your small business can compete with the big boys? They’re the same strategies that big companies and small businesses alike can use. A lot of them don’t cost any extra money, and when you carry out these strategies correctly, you will find that your business will be doing better every day. Small businesses can get the upper hand over larger businesses by becoming essential members of the community. Have your business publicly support local or even international causes, because if your name is on a cause that people support, they will be more likely to shop at your business knowing that you care about what they care about. You can do this on a small community level by merely offering your venue as a space for charity events or by sponsoring a town softball team. If a larger company has come into your town and is selling the same products you sell for less than you can keep up with, then you need to have another way to compel customers to come into your store. Make your customers feel good when they come to your store. Greet them with a smile, remember their names, make small talk; when your customers feel known and wanted in your store, they will want to return over and over again. An excellent way to get new people into your store is to go into the big store down the street and find out what they don’t have, then stock up on it. Chances are, if people are looking for a particular item and the big store doesn’t have it, they will probably head your way, and if you’ve got it, then you’ve just saved their day and earned a new customer. The internet is an essential tool for expanding your business outside of its local market. Build a website for your company, create an email list for your loyal customers, and offer them exclusive discounts or invitations to things like holiday parties so you can give back to your customers. Sign up for social media sites so you can keep in constant contact with customers. An important place for all small businesses to be on is Yelp because you can do damage control with people leaving negative comments about your store, or you can send thank you messages to those who leave positive reviews. Purchasing a virtual phone number for your business can allow you to interact with customers all over the world and therefore expand your reach outside of your local community. Along with social media and building a website, you should also consider getting a toll free number which is a useful advertising tool that keeps you connected to all of your customers. These virtual phone numbers also come packed with features like call forwarding, so you never miss an urgent call and automated greetings to give your small business the impression that it is more extensive and therefore more professional. Encourage your customers to return often by offering them incentives for their continued business. All of these strategies are either free or low-cost and can help seriously expand your business. If you take anything away from this article, be sure that it is to make customer service your #1 priority! Call center management knows that there are risks and rewards when it comes to running a business. However, some things, such as compliance and security are things that should never be risked. Information on your customers is sensitive data and needs to be continuously managed. Your business needs to find the leaks in security before any con artists can break in, which unfortunately is becoming a common practice today. Due to a streak of data breaches, the Federal Trade Commission has created new rules and regulations for security that your business needs to be up to par with. If your business is not up to the standard, you will find yourself dealing with huge fines and legal battles. In order for your business to stay compliant, you need to make sure that the following compliance acts are satisfactory. Encryption is a useful tool that allows companies to gain access to customer information by using coded messages that unauthorized users cannot get hold of. This can be used through call center interactions over the phone or through emails and chat. These encryption codes need to be adequately managed by your IT employees. Many call centers have a variety of login systems that can timeout very quickly. This can frustrate customers and agents alike, but there is a solution. Single sign-on is standard for the FTC and can work with several systems at once. Storing data is an essential piece of managing all data that is unfortunately overlooked by many companies. Ensure that your company has enforced multiple backups to your data storage and that old data is being disposed of when it is no longer necessary. When your storage becomes compromised, it can become a massive headache for businesses. Therefore, it is best to plan ahead and have good recovery software in place. Call centers use recording as a means to learn from mistakes and to look back on calls during disputes. However, recording important information can cause issues. In the past, call centers have had their agents turn off their recordings while being given important information, but that is not up to regulations anymore. What call centers can do is use an IVR to secure important data like credit card information and social security numbers. Also, in order to stay up to standards by the FTC, all callers must be notified that the call may be recorded. All call centers must be up-to-date on those consumers who have added their number to the do not call registry. Failure to stay up to date can result in massive fines. If you work for a debt collecting agency, the FTC is cracking down on those who do not follow the Fair Debt Collection Practice Act. Therefore, if your agents are using threatening language or shady collection practices, you could find your business in the midst of litigation. All call centers must provide crucial information such as interest rates and late fees to their consumers before a customer agrees to purchase a product. This act forbids companies from denying loans or credit to consumers based on their race, religion, marital status, age, gender, etc. GDPR is a relatively new regulation that call centers must accede to. This rule is for companies that store information for European residents whether or not the business itself is located in Europe. European customers can ask for their data to be erased. Businesses must grant their consumers their requests in a timely fashion in order to remain compliant. Therefore, if you have European customers, you must have a plan in place that can quickly erase data. If your call center is not fully compliant, you could face some serious headaches in your future. The truth is, your company can not afford to wait to become up to standard because of the mounting security risks and in light of the critical data breaches that have already happened to several major businesses. 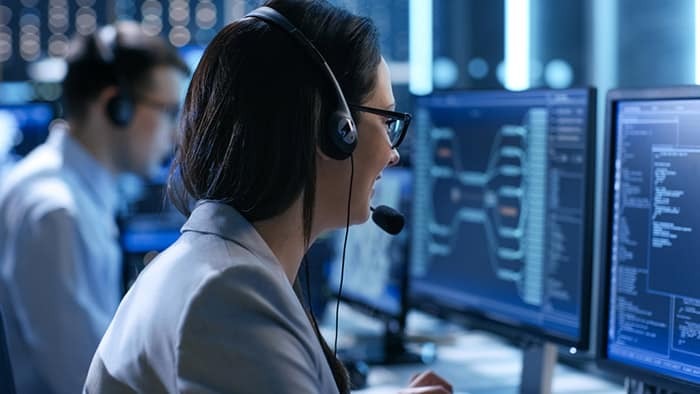 Be sure that your vendors and IT staff are aware of all new regulations as they both play a significant role in call center compliance and security. The best way to benefit your company is to improve the quality of life of the employees that help you run your business. If employees have access to wellness programs that enhance their performance and reduce their health risks, your business can, in turn, mirror the happiness and healthiness of its employees. Employees who are happy with their companies generally have more energy at work and take fewer sick days. Creating a wellness program for call center employees is essential to creating a healthy workplace environment. Because call center employees must be seated at their desks throughout the day and generally have strict schedules to follow, they are at risk for a variety of health issues. Investing in your call center employees can have a significant impact on your business if you are willing to make the investment. These ventures can include a fitness center, education on wellness techniques, company health fairs, access to free or low-cost flu shots, weight loss programs, providing healthy foods and snacks, and programs to help employees quit smoking. You might be thinking that the costs for these programs are too high, but in truth, they are worth it in the end. Call center representatives become the face of your company when a customer has a question or a problem. If your call center employees are unhappy and unhealthy, they will become irritable over the phone or forgetful. Because your clients are the most essential part of your business, it is vital that the person they speak to is helpful and friendly. Once you create an environment where employees enjoy coming to work, you can stand back and watch as your business grows. Some businesses make budget cuts to their employees’ healthcare because of rising costs and unstable economies. However, cutting back or eliminating these incentives will not benefit your business in the long run. Giving your employees the opportunity to see a doctor the moment they get sick or providing a place for them to workout before or after work keeps insurance premiums at lower costs. Research has shown that businesses who cut these from their budgets will eventually see their premiums rise by 10% each year. Providing healthcare onsite or on-demand can also reduce the spread of illnesses. This is essential because employees who work in a call center are in very close quarters, so if one person gets sick, eventually everyone will catch it as well. Once your business begins to provide these incentives to your employees, you will find that employees are more likely to be motivated to get in shape. You can encourage this motivation by doing company-wide fitness challenges with monetary incentives or prizes. If you are thinking of beginning a wellness program for your call center employees, but you have a limited budget, take note of what your employees would like to see from you. This will reduce the possibility of wasted money on a program that won’t be used. If you were thinking of adding a yoga studio to your building, find out if the majority of your employees would be interested in participating first. A small way to boost wellness in your employees is to encourage standing up and stretching between calls. You can also print out an infographic of different stretches that can easily be done at a desk and hand them out for those who might feel silly starting this practice. To encourage your employees to eat healthier, provide healthier snacks and plenty of water and tea instead of soda and juices. You can also organize a group walk during lunch breaks or offer to subsidize fitness memberships. Another low-cost option is to utilize a spare room and turn it into a meditation or nap room where employees can recharge their batteries. Encourage wellness to all of your employees and celebrate employees who reach healthy milestones, too. If a call center employee takes on an office-wide weight loss challenge and returns with significant results, be sure to reward them for their hard work! Other employees will see these results and might be inspired to try it out for themselves. Providing wellness programs is a logical business decision with a high ROI. After all, when your employees are happy and healthy, they’re going to work better for your company overall.